10 Nov 2015 --- FrieslandCampina has opened a new production facility for galacto-oligosaccharides (Vivinal GOS) in Borculo. Its Vivinal GOS is used in a range of infant nutrition products. 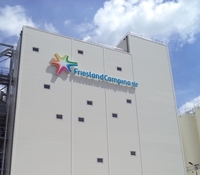 The expansion of production will enable FrieslandCampina to respond to the increasing worldwide demand for high-quality ingredients for use in infant nutrition. As Tine Snels, Executive Director of FrieslandCampina Ingredients, explains, “Our new hypermodern facilities mean we can now respond even more effectively to the growing demand for Vivinal GOS, both for use by other parties and in our own infant nutrition products. Since Vivinal GOS was introduced in 2000, products containing it have been fed to over hundred million children around the world."